When I committed to do Blogtoberfest again I thought I would look back on the posts I did two years ago. How funny it is to look back on what I wrote and how I have evolved as a blogger (I now get a lot more comments thanks to an incredibly supportive network and readers!). 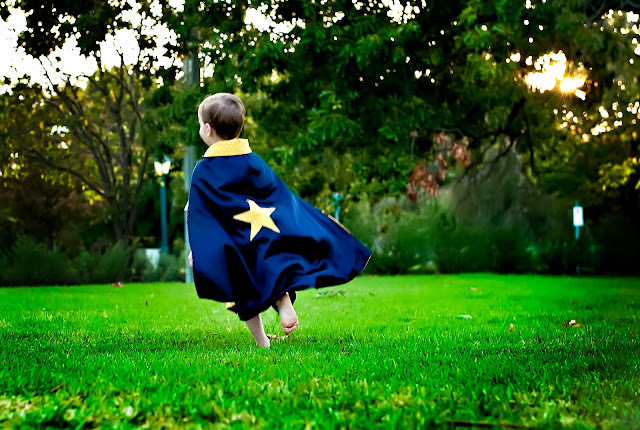 My nephew will be getting a cape like this for his third birthday (my son when he was 3!). The first one I wrote was about handmade gifts. I asked whether people appreciate receiving handmade gifts. I love making things and I put so much time and effort into them that I wonder if people truly appreciate what they are receiving. On reflection two years later (and two years wiser), I really think you need to pick your audience. My son is nearly 7 (next week) and I realised ages ago that making gifts for his friends just isn’t the done thing. Miss 4 however – well a pretty skirt or dress is just the perfect thing right? What little girl (or mummy!) wouldn’t love something like that. It is kinda expected to make handmade gifts for sewing friends and of course for newborn babies (since my business caters to them). I also find my mum and mother in law love them too. So yes I think most people do appreciate handmade gifts. The rest, well you will get a token something or a giftcard! Do you like making and receiving handmade gifts? I love recieving handmade gifts from friends. I was given some lively things for baby. I think when you are given handmade gifts from friends, so much more thought goes into it. I love giving and receiving handmade, but you are so right. You do have to choose people who will appreciate handmade. I love LOVE receiving handmade gifts, because I know the amount of effort, thought and love that goes into making something. But I am always nervous to make things for others because I always feel like my stuff isn't good enough and they might be rolling their eyes and saying "geez who invited the penny pincher over there" (HA! IF they only knew how much more expensive handmade gifts usually are). I guess like you said, picking your audience is important! Celebrating turning seven - Beckham style!